I am sharing a favorite collection of 6 Colorful Ruby Jewelry Designs today. Wait till you see these exquisite pieces of vintage jewelry. They look like warm 18 or 20 carat gold to me. Some of them have enamel details in black, green, and red. All the pieces feature clear, red rubies. We have two rectangular and square designs to begin our collection. We have two horizontal pieces next, one with a tassel. Then we finish with two round shaped pieces. They are great to use as Mixed Media and Collage Projects. Enjoy! Our collection begins with an Antique Peacock Jewelry Image! This is a lovely ornate piece of Jewelry that features what looks like a Peacock Tail on it! The tail looks like it’s encrusted with Rubies. It appears to be a very intricate piece with lots of cutouts on it. I’m guessing it’s a brooch. 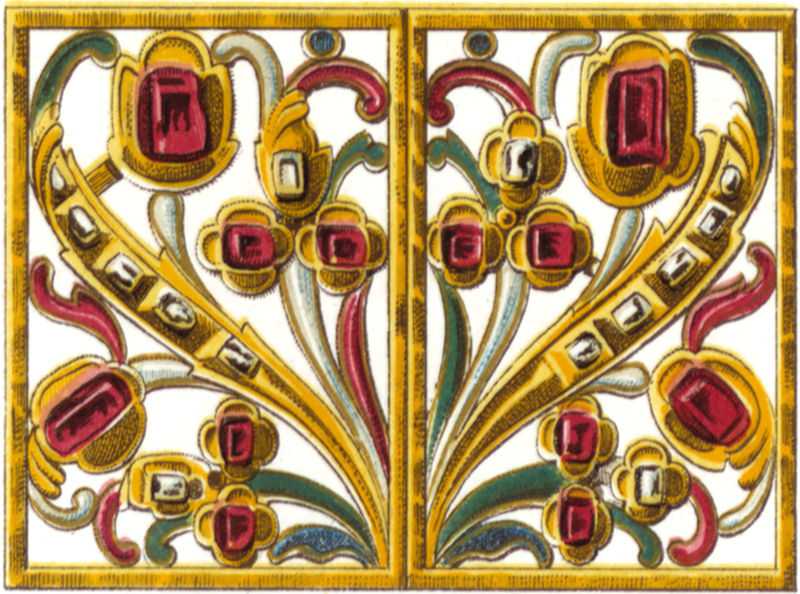 Here we have a Fab Antique Square Gold and Ruby Jewelry Graphic! This stunning jewelry square features rubies and diamonds set in a floral pattern with green and red enameling. A thin brushed gold frame wraps the piece and divides the center into two identical halves. The above Stunning Vintage Jewelry Green, Gold, Ruby Brooch Image is unique! This elongated oval brooch features rubies and diamonds set in an ochre tone gold with green enamel scrollwork. The right and left edges are fleur de lis shaped gold flowing from a lotus-shaped shield set with rubies and diamonds. Bars of etched gold span the top and bottom centers. I just love this Beautiful Old Pendant Jewelry with Tassel Image! This long, slim oval pendant with gold tassel is shown horizontally. It features rubies and diamonds set in a thin oval frame of gold. The gemstones are set in lotus shaped flowers with an S-shaped green vine meandering around them. 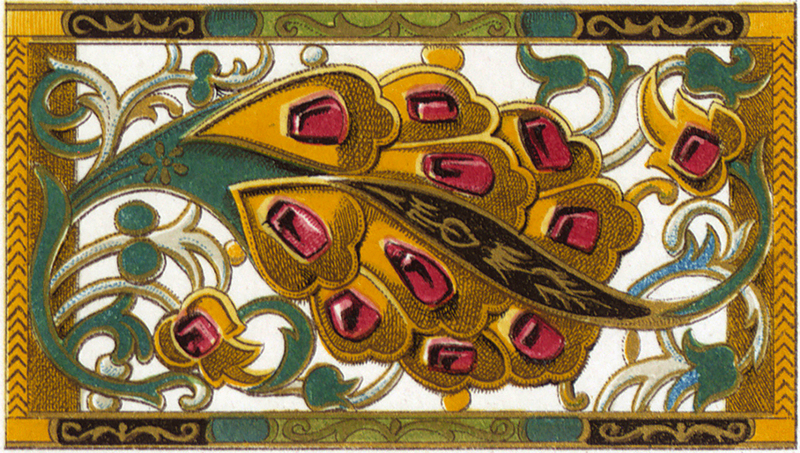 The top is a green, rounded triangle leaf shape set with rubies and veins of gold connected by gold chain. Above is an Antique Ruby and Diamond Jewelry Brooch Image! 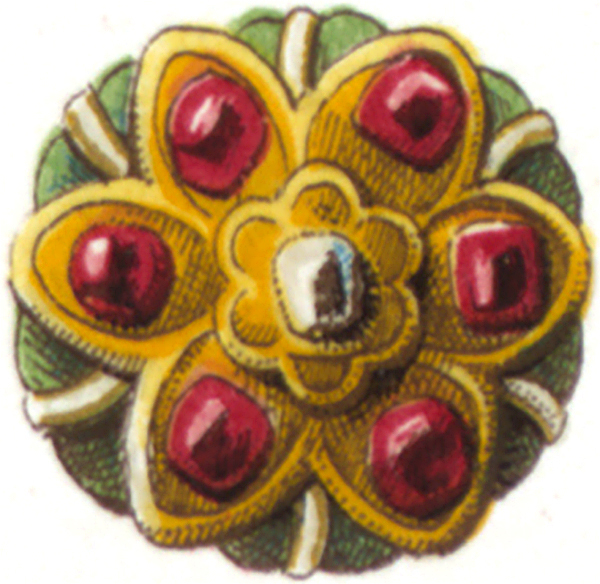 This domed, round brooch illustration features six large round and square cut rubies on gold petals. They surround a cushion cut center diamond resting on a 6-petaled gold flower. The edges between the gold petals are green with gold stems running toward the edge. 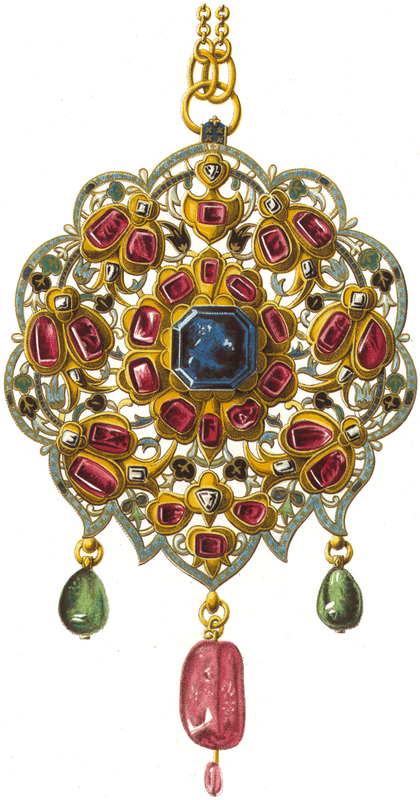 Our final piece in the Colorful Ruby Jewelry Designs collection is this Gorgeous Vintage Jewelry Ruby Pendant Image! This beautiful open scrollwork round pendant features over 25 rubies surrounding an octagonal blue sapphire on a gold chain. Tiny diamonds, giving off a blue hue, dance around the filigree edges. Two teardrop emeralds drop on either side of a large ruby with a tiny dangle ruby at the bottom of the piece. I hope you enjoyed this curated collection of 6 Colorful Ruby Jewelry Designs. You might also like our 10 Best Vintage Crown Images HERE or our 40 Free Valentines Day Images HERE! Vintage Domino Charms – Design Team Lynne Morgado! 10 Anchor Clip Art Images! 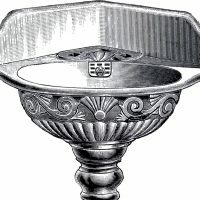 9 Sink Clipart Vintage Graphics -Pedestals etc – Updated! « 11 Medieval Lady Images and Costumes! 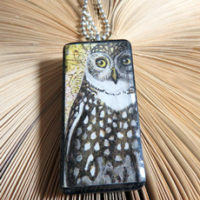 ooh, this is an antique piece of jewelry that will look so nice in one of the mixed media collages taught by Heather. I can imagine adding some bling to this image and use it there, thanks so much!! That sounds perfect Rupa, bling away!! Oh, these brilliant colours are so rich looking! Such a beautiful piece!! Talk about royalty! I would like to find a chain graphic and add this as the pendant … then transfer to a plain white tee shirt…love love love Bling!